Winery - Synonym for noble sweet wine in perfection. The vineyards are between Illmitz and lake Neusiedl. Alois Kracher, who died in December 2007, will always be remembered as one of the most important ambassadors for Austrian Wine all over the world. Today, Gerhard manages the winery with the help of his life-in partner Yvonne. 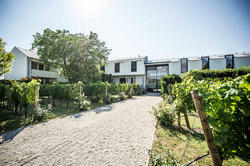 The range offered by what is undoubtedly the most widely known Austrian wine estate features the world-famous Trockenbeerenauslesen as well as Beerenauslesen, Auslesen, Eiswein (ice wine) and small amounts of dry white and red wines.